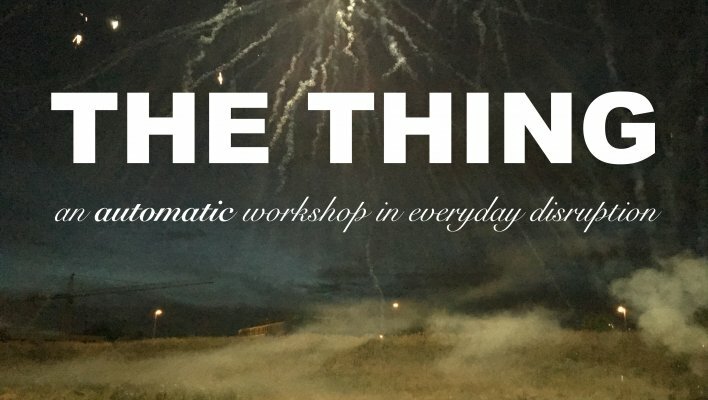 The THING, an automated and hybrid form between performance, workshop and journey. Over 4 episodes, each about 4 hours long, The THING takes its participants on an exploration of the overlap between things which matter to the world, and a thing each of us could set into motion at any moment. In The THING, no charismatic leader stands in your way. The only ones present are you: a group of 8–12 people who open a suitcase and follow a wild mix of different triggers as a guide. Everyone knows there are inherent rules and limitations to what is possible or acceptable, either on a personal or social level. But what happens when you’re confronted by the sense that some of those rules need to be bent, or broken? The THING frames the impulse that comes from that mistrust of ones established norms; from having 'had enough' of not taking up the challenge of trespassing those limits. We are living in times when the problems we face seem to multiply daily. Human inequality and environmental damage, for example, have reached proportions both obscene and critical. Why don’t we do something? There is a sense of being stuck, blocked. We like to think that art can at the very least unblock, and of this workshop especially as a kind of de-blocking agent, principally by working towards a practice, accessible to anyone and drawing from a variety of disciplines, of creating moments of exception; something like a conscious insertion of a parenthesis into daily life within which one’s normal behaviour is to be suspended, and deviation finds legitimacy. The THING focuses on those aspects to our lives which in some way relate to other people, so that any action which constitutes taking a risk, or going beyond the limits of one’s usual behaviour, will have a reciprocal consequence for at least one other person. While it’s certainly about contemplating and taking personal risk, the workshop could equally be thought of as an exercise in creating accomplices. ‘To surpass oneself’, thought of in this way, suggests a useful double meaning. More than just encouraging a ‘bucket list’ (the things you want to do before dying) the workshop makes ‘a claim on your capacities’. Participants work to identify and amplify that potentiality, leaving them by the end of Episode 4 ‘on the edge’, ready to jump. Christophe Meierhans (Switzerland, 1977) started out as a composer but works in a wide variety of media. He has previously appeared at Kaaitheater with much talked-about productions like Some use for your broken clay pots (2014), in which he presented a new form of democratic regime, and Verein zur Aufhebung des Notwendigen – A hundred wars to world peace (2015) – an exercise in anarchy through cooking. Christophe experiments with participation and the politicisation of ostensibly ordinary acts. From 2017 to 2021 Christophe Meierhans will be artist in residence at Kaaitheater. Ant made his first show in 1998 under the name Rotozaza. - a performance-based project which ended up spanning theatre, installation, intervention and writing-based works. His work, though varied in tone and content, has consistently played with a tension between liveness and automation, especially through the delivery of instructions to unrehearsed guest performers, or more recently to the audience themselves (“Autoteatro”). He was head dramaturg for 'Projected Scenarios' at Manifesta7 Biennial for Contemporary Art and has contributed to projects by others, including Jerome Bel, Forced Entertainment, Florian Malzacher and Ivana Müller. Ant has also worked as coach / mentor for artist programmes such as MAKE (Ireland), A-PASS, Sound Image Culture (Beligum), MFAPA at the Iceland Academy of the Arts (Iceland) and Dasarts (Netherlands) where in collaboration with Edit Kaldor he designed and mentored a 10-week block, ‘Every Nerve’. He has created and led workshops worldwide, including 'Fantasy Interventions - Writing for Site-Specific Performance', and ‘Raising Voice in Public Space’ with Edit Kaldor.